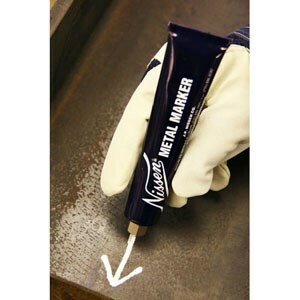 The Nissen Metal Marker utilizes a specially formulated polyurethane paint to provide permanent marking under almost any conditions. The marks will remain bright, clear and legible even on material that will be stored outside for long periods of time or material that will receive heavy abuse. Marks on all metals, wood, rubber, glass, etc. Marks on any rough, smooth, wet, oily or dry surfaces. Marks withstand heat and weathering; they won't chip, peel, fade or rub off. Available in 12 lead-free, high gloss colors and in 3 point sizes.